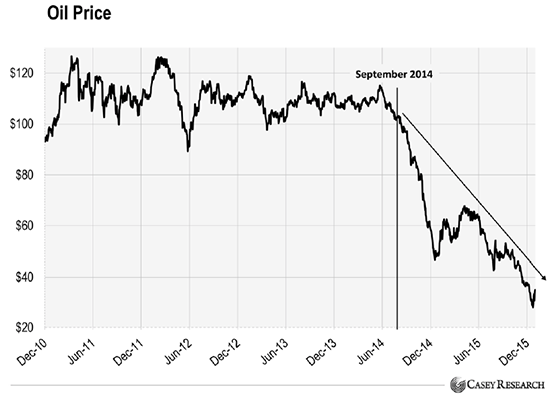 The oil market price is setting up for one heck of a fall. Now, could this large oil correction cause the next stock market crash? Time will tell. However, the indicators in the oil market are showing the largest net commercial short positions in history. The current net commercial short positions in the oil market are even higher by 174,000 contracts than the level when the oil price fell from $105 in mid-2014 to a low of $30 at the beginning of 2016. 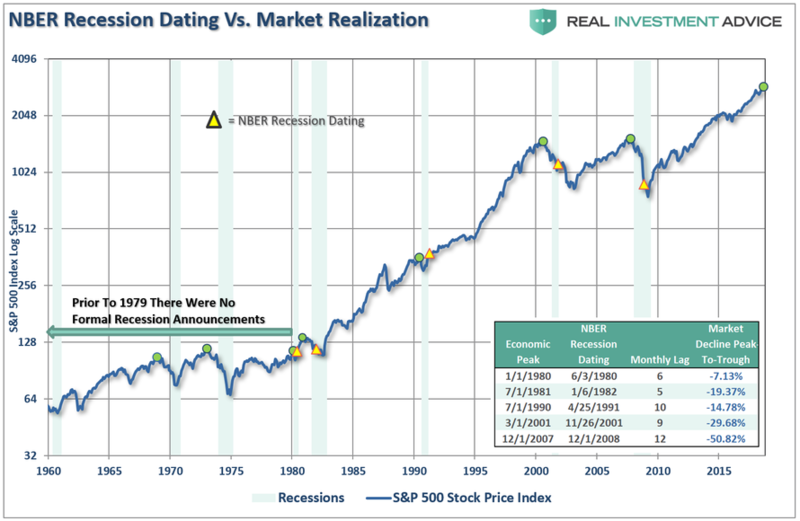 Furthermore, there was a previous trend in the 1980’s that suggests we are setting up for a MAJOR stock market crash. I discuss the details of the current record net commercial short positions and the similar setup that took place during the 1980’s in my newest video, Will The Coming Big Oil Price Drop Cause The Next Stock Market Crash? As we can see in this COT Report (Commitment Of Traders), the commercial net short positions jumped from 648,000 to 674,000 in the past week. However, this chart only shows the change traders’ positions over one year. To see how large the present commercial net short positions, please check out the short 12-minute video. I believe the oil and stock markets are setting up for one large correction or even a market crash. Thus, as the stock markets crack, we will likely see a huge move by retail investors into Gold ETF’s as well as precious metals investors tremendously increase their demand for physical gold and silver investment. As we roll into 2018, analysts and investors are more optimistic that the oil market will further tighten next year and support higher oil prices, but rising U.S. shale production will likely cap any significant price gains. On the demand side, expectations are that global economic growth will support solid oil demand growth. On the supply side, Venezuela’s dire situation, possible new sanctions on Iran, and increased tension in the Middle East mostly with the Saudi-Iran issues and the Iraq-Kurdistan standoff may take more barrels off the market than OPEC and friends plan, and send geopolitical jitters through the oil market. However, according to energy policy expert Michael Lynch, there remain three potential events in the markets that could send oil prices tumbling. These include a large correction in the U.S. stock market that could spread to a sell-off in commodities; one of the OPEC members or Russia breaking away from the unusually strong compliance to the cuts we have seen so far; and U.S. oil production rising so much as to make OPEC see it as a threat to its long-term oil market share. In markets, there are already some signs that we may be seeing some bubbles, Bitcoin being the most likely candidate, according to Lynch. In addition, the price to earnings ratio of the S&P 500 index is now over 25, well above the mean historical average of just over 15. 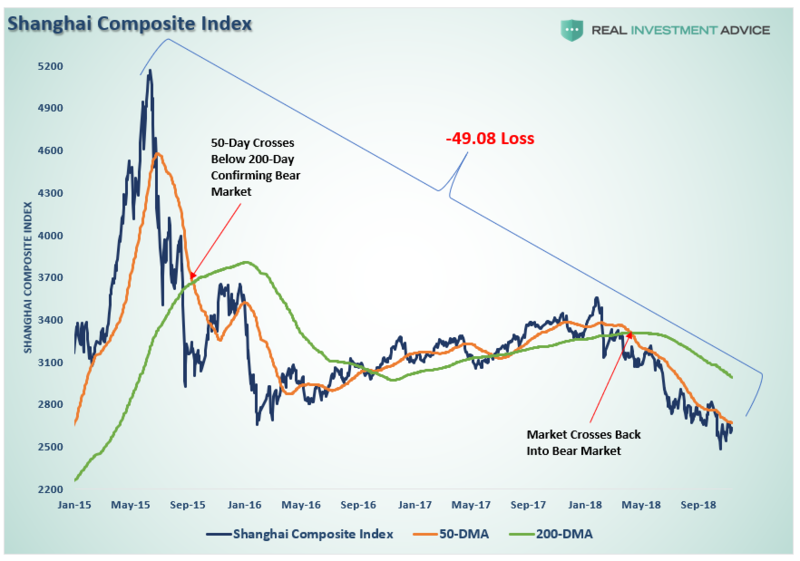 Last week, Fed Chair Janet Yellen said, referring to the high valuation in some asset classes, “the fact that those valuations are high doesn’t mean that they are necessarily overvalued.” According to VTB Capital’s Global Macro Strategist Neil MacKinnon, the ultra-low volatility in U.S. equities this year is “very vulnerable” to shocks, and current stability could actually bring future instability. Even from Japan – whose export producer prices are soaring. The oil price collapse that started in 2014 pushed down input costs that companies – the “producers” – faced. 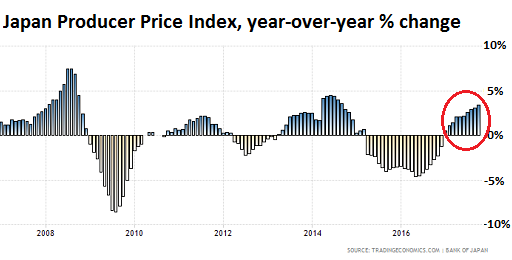 And producer price indices, which measure inflation further up the pipeline, plunged. But this is over. And the biggest export powerhouses in Asia that have ballooning trade surpluses with the US, show how. On a monthly basis, the index rose 0.3% from September. But excluding “extra charges for summer electricity,” the index jumped 0.6% month-over-month. The biggest movers: Nonferrous metals prices soared 22.4% year-over-year, petroleum and coal products 15.8%, iron and steel 9.7%, and chemicals and related products 3.6%. On the negative side of the ledger there wasn’t much activity: prices for electrical machinery and equipment edged down -1.1%, for business oriented machinery -0.4%, and production machinery -0.3%. Export prices in October jumped 9.7% year-over-year in yen terms and 3.8% in contract-currency terms. Export prices of Metals and related products soared 25.8% in yen terms and 17.7% in contract-currency terms. Chemical and related produces soared 16.3% and 11.8% respectively. Other primary products and manufactured goods prices jumped 10.3% and 4.2%. All three of them soared in double-digit percentages just from September! Japan has exported $101 billion in goods to the US so far this year. Mayhem has crisscrossed the global oil markets since 2014: Huge losses for Big Oil, including teetering, over-indebted, state-owned giants like Mexico’s Pemex and Brazil’s Petrobras; bankruptcies among some of the smaller players; cuts in production in the US, Canada, and China where production plunged 7.3% in May from a year ago, the biggest decline since February 2001; hundreds of thousands of people losing their jobs across the globe; deep trouble in Brazil, chaos in Venezuela…. Record levels of crude oil stocks have become a global phenomenon. In the US, crude oil stocks are at 532 million barrels, a record for this time of the year in EIA’s data series going back 80 years. Even driving season has barely made a dent so far; stocks remain 63.6 million barrels above the mega-record levels a year ago. Gasoline and distillate stocks are 19.2 million and 18.6 million barrels above their levels a year ago. Oil tankers full of crude are lined up outside the port of Singapore and others, some waiting to unload cargo, others being used for crude oil storage at sea. Across OPEC, storage levels of petroleum products rose to 3,046 million barrels in April, or 13% above the five-year average. The world is awash in oil. In the process, OPEC has been declared dead or dying because it was unable to agree on anything, refused to cut production, and brushed off calls to do something, for crying out loud, about the collapsed prices — which, despite the mega-rally, remain down over 50% from where they’d been before the oil bust began. But there was one thing OPEC was able to accomplish by not agreeing to buckle under pressure and cut production: it increased its market share. Hangover of oil dependence has only just begun. It was supposed to be the biggest, most ambitious, most lucrative infrastructure project Spain’s construction industry had ever undertaken on the Arabian Peninsula. Launched three years ago, the high-speed rail link project between Medina and Mecca was a dream come true worth some €6.7 billion, the perfect payoff of decades of patient lobbying of the House of Saud by Spain’s former King Juan Carlos I. 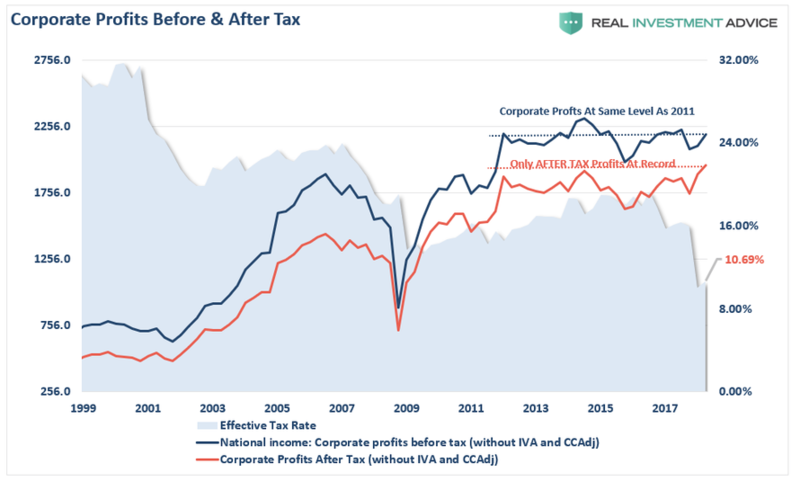 But now it’s a rotting financial albatross around the necks of 12 large Spanish companies. Even from the beginning, things were not easy. Within a year and a half, the project was suffering significant delays. And two months ago, the consortium asked the Saudi government for more funds — “an absolute minimum of €1.4 billion” — to cover the Saudi Railways Organization’s “unforeseeable demands,” such as, amazingly, keeping desert sand off the tracks. None of the consortium partners want to take responsibility — or the attendant financial hit — for keeping sand off the tracks. And the House of Saud, already hemorrhaging money due to the oil bust, is in no position to pay Spanish companies extra funds for it. Now, news is leaking that the Saudi Railway Organization stopped paying advances on the consortium’s work over six months ago. According to the Spanish financial daily Expansión, the consortium could be owed hundreds of millions of euros in late payments. Although the reasons for non-payment are as yet unconfirmed, sources in Spain are blaming it on the House of Saud’s acute cash-flow problems. Saudi Arabia’s oil-dependent economy is in a bit of a pickle. For its budget to break even, the country needs an oil price of $104 a barrel, claims the Institute of International Finance. 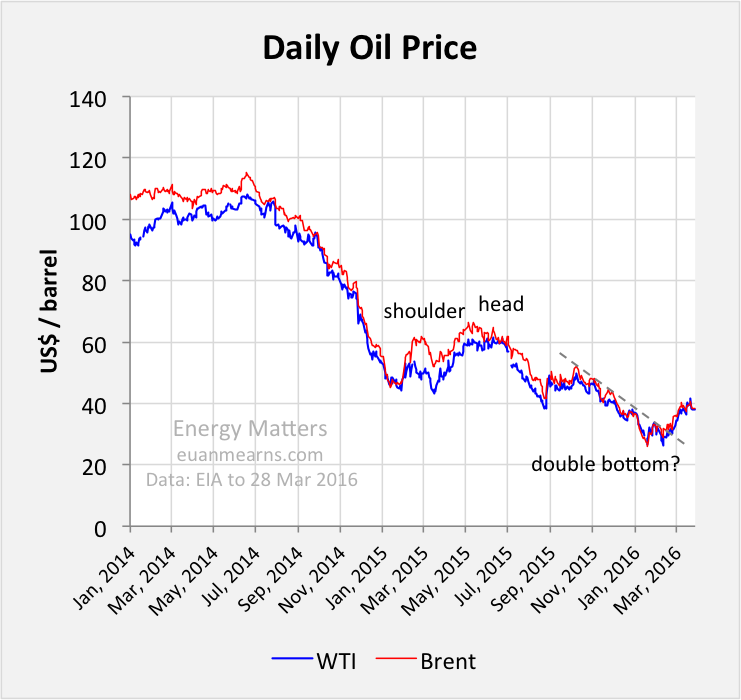 Why no economic boost from lower oil prices? There is no question that lower oil prices have been a big windfall for consumers. Americans today are spending $180 B less each year on energy goods and services than we were in July of 2014, which corresponds to about 1% of GDP. A year and a half ago, energy expenses constituted 5.4% of total consumer spending. Today that share is down to 3.7%. Consumer purchases of energy goods and services as a percentage of total consumption spending, monthly 1959:M1 to 2016:M2. Blue horizontal line corresponds to an energy expenditure share of 6%. OPEC-member Angola, which is dependent on oil for 95 percent of its export revenues, is facing an urgent cash flow problem, and the only way out is external help as the dominoes start to fall. Angola has sought financial aid from the International Monetary Fund (IMF) to weather the crisis engulfing the African nation due to low oil prices, while President José Eduardo dos Santos has gone as far as to dip into the country’s sovereign wealth fund just to pay civil servant salaries. Along with the drop in oil prices, it doesn’t help that Angola’s economy has largely become a kleptocracy—a government run by those gunning for status and personal gain at the expense of the nation. For those who may argue with this terminology, we can look at the Angolan President’s daughter, Isabel dos Santos, who is worth $3.3 billion and is the richest woman in Africa, according to Forbes. Meanwhile, 68 percent of the Angolan population lives below the poverty line. President José Eduardo dos Santos has run the country since 1979, but until now, he has avoided seeking aid from the IMF, most likely because the IMF has been known to delve into the state’s finances to locate irregularities—irregularities such as the President’s daughter’s net worth being over 6,000 times Angola’s GNI. Only a few believe that the actions of the IMF may help bring an end to the opaqueness of the current rule. Consumer purchases of energy goods and services as a percentage of total consumption spending, monthly 1959:M1 to 2016:M2. 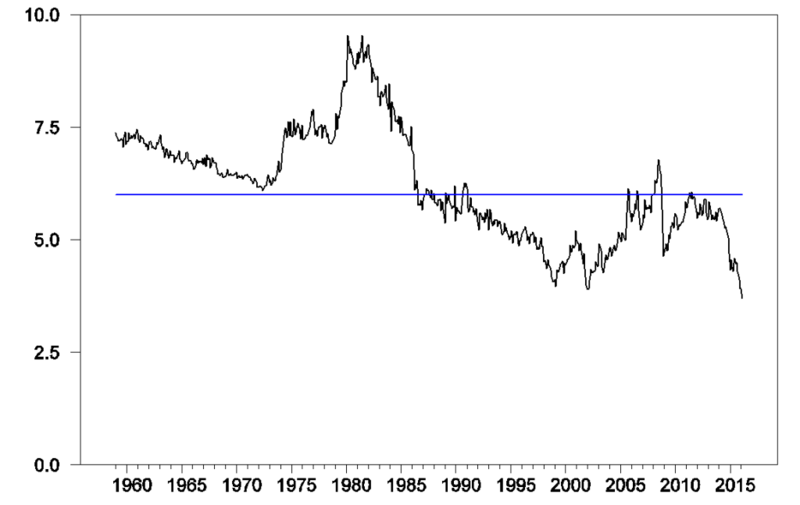 Blue horizontal line corresponds to an energy expenditure share of 6 percent. It was just a matter of time before Pemex, Mexico’s chronically indebted state-owned oil giant, began dragging down the national economy it had almost single handedly sustained for over 75 years. The company has been bleeding losses for 13 straight quarters. As of December 31, it had $114.3 billion in assets and $180.6 billion in liabilities, a good chunk of it denominated in dollars, leaving a gaping hole of $66.3 billion (negative equity), after having been strip-mined over the decades by its owner, the government. And given these losses and the equity hole, new credit is becoming harder to come by. Now it seems that Mexico’s worst nightmare is beginning to come true, thanks in no small part to Moody’s Investors Service. The credit rating agency last week downgraded Pemex’s credit rating from Baa1 to Baa3. In November Pemex had a perfectly respectable credit rating of Aa3; now, just six months later, it’s perilously perched just one notch above junk. “Moody’s believes that Pemex’s credit metrics will worsen as oil prices remain low, production continues to drop, taxes remain high, and the company must adjust down capital spending to meet its budgetary targets,” the report said. That was for Pemex. Now Moody’s also changed the outlook for Mexico’s sovereign rating from stable to negative. This, coupled with the mounting risk of a credit downgrade, heaps further pressure on a government already struggling to shore up its balance sheet. Hardly helping matters is the fact that oil prices, a key source of government revenues, continue to languish at low levels, while the prospect of a massive bailout of Pemex looms ever larger. As if that were not enough, Mexico’s manufacturing industry is beginning to feel a very sharp pinch from weakening U.S. consumer demand. Since the possible double bottom at $26 formed on February 11th the oil price has staged a rally to $40 (WTI). Traders lucky enough to buy at $26 and sell at $40 have pocketed a tidy 54% profit. Very few will have been this lucky. The trade was stimulated by news that Saudi Arabia and Russia had agreed to not increase production this year which is hollow news since neither country could significantly increase production no matter how hard they tried. Profit taking has now driven WTI back towards $37 as of 1 April. What next? There is precious little sign of significant production falls anywhere. 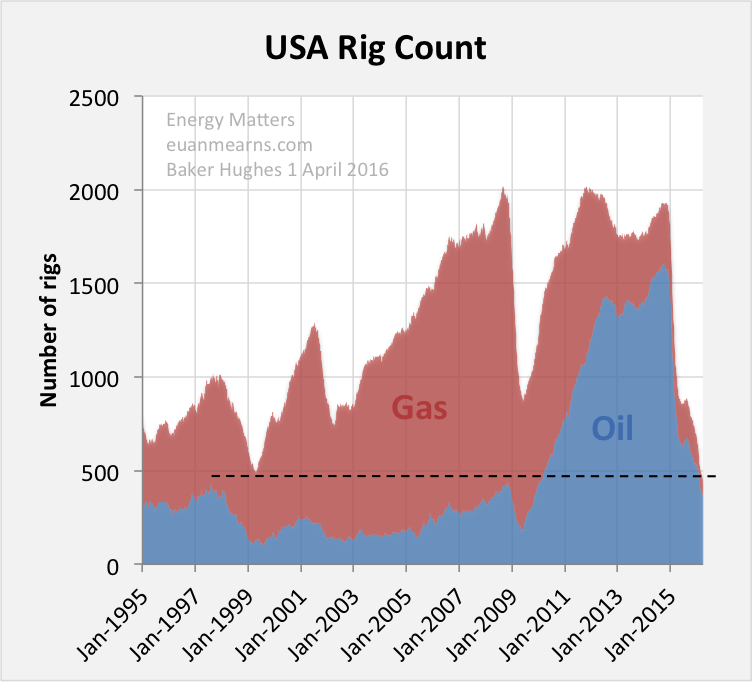 US and international rig counts continue to plunge. And there is little sign of global demand recovering as OECD economies buckle under the weight of misguided energy policy and debt. There is a risk of the plunge in oil price resuming. This article first appeared on Energy Matters. EIA oil price and Baker Hughes rig count charts are updated to the end of March 2016, the remaining oil production charts are updated to February 2015 using the IEA OMR data. Figure 1 WTI tested the $26.68 low set on Jan 20 by returning to $26.19 on Feb 11. Since then a rally to $40 has been staged and the price has moved above the near term downwards trend line. Charts have limited value in prediction and must be used in conjunction with fundamentals. For now I don’t believe this chart is providing clear direction. Fundamentals remain chronically weak and the next chart points to an on-going plunge in price. But only time will tell. 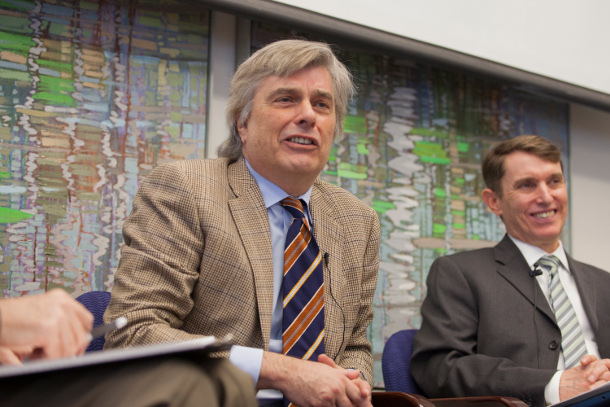 Former CIBC world markets economist Jeff Rubin at SFU’s ‘Carbon Talks’ panel. On the right is Vancity’s mutual fund manager Dermot Foley. Photo by Mychaylo Prystupa. The oil sands are downsizing. Alberta’s Big Oil CEOs are talking to environmentalists. And proposed oil pipelines are in serious trouble. Those were the takeaways from a trio of experts who spoke in Vancouver Wednesday at a “Carbon Talks” event hosted by Simon Fraser University with the David Suzuki Foundation and the Centre for International Governance. And the reasons for them have a lot less to do with vocal activist opposition or the Trudeau government’s climate commitments than they do with the brute forces of the global marketplace for oil. It was Jeff Rubin — former CIBC World Markets chief economist and now energy futurist — who declared some of Canada’s largest oil sands operations doomed to be shuttered. The world is awash in oil. The so-called “shale gas revolution,” using fracking technology in the U.S., has brought cheap shale oil to the surface in abundance in North Dakota and Texas. That, plus the actions of Saudi Arabia and its OPEC partners to flood the market with low-cost oil, has crashed benchmark global oil prices from highs above $100 a barrel two years ago, to prices today in the high $30 range. The story assignment from The National was simple. 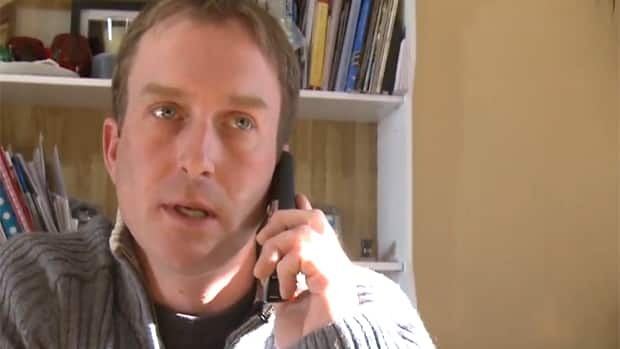 Go to Alberta and talk to regular people about the crash in the price of oil. Humanize the downturn. Harsh economic numbers coming out of Alberta aren’t hard to find. A projected deficit of $10.4 billion. An unemployment rate of 7.4 per cent, the highest mark since 1996. Then there was the startling projection from the Conference Board of Canada last week that Alberta will be the only province to see its economy shrink in 2016. But what do these figures mean for people? How the downturn affects individual lives is much harder to figure out. It is not always easy to get people to talk about these kinds of things. People who’ve just lost their jobs are busy trying to find another one, or they’re embarrassed by their situations. But here are three people who agreed to speak to us and share some of their personal experiences during Alberta’s current downturn. Sonnenberg, 35, worked for five years on a drilling rig in the oil patch. He started at the bottom as a leasehand and worked his way up to derrickhand. Before he was laid off in January he was making $40 an hour. He never thought the good times would end. Quite simply, the Saudis want to maintain their market share, but their means to control that are dwindling. The whole internet is jam-packed with analysis portraying Saudi Arabia and OPEC as villains for the oil price collapse. On a closer look, however, the Saudi’s could have taken no reasonable steps to avert this situation. This is a transformational change that will run its full course, and the major oil producing nations will have to accept and learn to live with lower oil prices for the next few years. As seen in the chart above, barring the period during the last supply glut, the Saudi’s have more or less maintained constant oil production, increasing production only modestly at an average of roughly 1 percent per year. The last time the Saudi’s reduced production, the only objectives they achieved were higher debt and lower market share. It’s no surprise that this time, they were unenthusiastic about following that same path. Had they resorted to any cuts, it would have ended with them losing market share and revenues—nothing more. When it comes to oil, Saudi Arabia has enjoyed an unopposed leadership position for a long time. When that position was threatened by the U.S. shale oil, it was natural for them to attempt to protect their market share. However, like every other industry, leaders tend to be lax, ignoring competition until it’s too late. The same happened here too—most oil producing nations failed to take corrective measures, and they are facing its consequences now. Two powerful men, colluding at a palace in the Middle East. In September 2014, U.S. Secretary of State John Kerry flew to Saudi Arabia. He was there to meet with King Abdullah, the country’s ruler and one of the richest men in the world. Informed observers say Kerry and Abdullah drew up a plan at this meeting to destroy their common enemies: Russia and Iran. Oil is the world’s most traded commodity. Saudi Arabia is the world’s largest oil exporter. It has arguably more control over the price of oil than any other country does. Insiders say Saudi Arabia agreed to flood the oil market at this secret meeting. The purpose was to drive down the price of oil. This would hurt Russia’s and Iran’s economies. They both depend heavily on oil sales. They wanted to hurt Russia for supporting their regional foe, Syrian President Bashar al-Assad. They wanted to hurt Iran for the same reason. Iran is the Saudis’ fierce geopolitical rival in the region. Their strategy has had some success. As you can see in the chart below, the price of oil has plummeted over 70% since John Kerry’s secret meeting with King Abdullah in September 2014. There’s so much conflict in the Middle East—but oil prices are falling. And despite China’s economic slowdown…it still imported more oil in 2015 than in 2014. China is the world’s number two oil consumer behind the U.S. Turmoil plus demand says oil should be going up, not down. But the mystery is explained by the Saudis’ oil war and their strategy of flooding the market to bankrupt competitors.